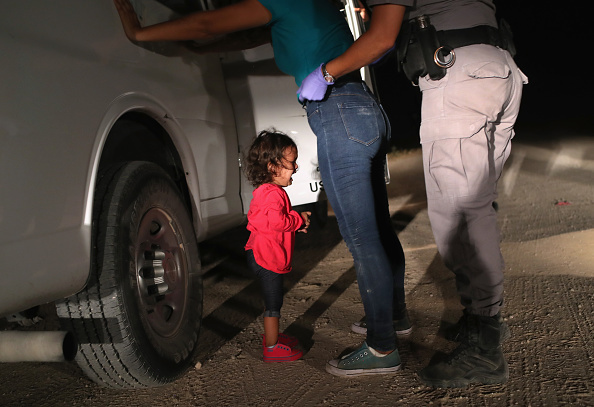 A two-year-old Honduran asylum seeker cries as her mother is searched and detained near the U.S.-Mexico border on June 12, 2018 in McAllen, Texas. Photo by John Moore/Getty Images. Subject to copyright and used here under license. In the uproar over the separation of children from illegal immigrants by the US government at its Southern border, it has been revealed that the Trump administration was not the first to carry out such separations. It has been reported that children were being separated from their parents at detention centres for illegal immigrants under the previous Democratic administration as well. This was a “protective” measure under a policy against the detention of children. Child protection was also used to justify the current government’s separation of children from parents. The US Attorney General Jeff Sessions said the policy was not to remove children as such, but to take them into “care” of the US Department of Health and Human Services (DHHS) while their parents were being prosecuted for illegally crossing the border. Clearly the US government was willing to use children as a bargaining chip to deter immigration, until President Trump was forced under immense public pressure to declare a policy for keeping families together at the border. At the same time, Trump’s critics have had to accept that the laws under which the children were removed were enacted several years before he came to power. His opponents have counter-attacked by accusing him of being too harsh in enforcing these laws. But surely, some attention needs to be paid to how such harsh laws enabling the removal of children from parents came to be passed in the first place. Although Trump has retracted his policy of child separation at the border, those concerned about children should also be questioning the ease with which the practices and machinery of the US child protection services (CPS), which is overseen by the DHHS, was used to seize and confiscate children from their parents (for the relationship of the federal government to the state child protection system in the USA see here). DHHS is being secretive and unresponsive about the migrant children in its custody. Trump’s new policy does not deal with the children already taken into DHHS custody. Although the public has been pressing for answers about their fate, the DHHS is being unduly secretive and unresponsive. It is being very closed about the whereabouts and conditions of the taken children. Parents are said to have received no papers when their children were taken. They were not informed until the press found out that the children were actually flown thousands of miles away from them to “shelters” in other states. There are extremely disturbing accounts of parents being tricked into parting with their children by being told they were just being taken for a bath. There are some shocking claims about how DHHS is treating children taken into its custody. There are claims that children have been given drugs to keep them sedated and compliant. There are also claims that the children are being cruelly treated, with siblings being told not to hug each other when they cower together in their holds. All this is very shocking to a public that has been largely unaware of how child removals by the state take place. But the stories have an all too familiar ring to parents and activists who have been battling the US CPS system for years saying it has been taking children for no good reason and ill-treating them in foster care. As I wrote in my article “The US immigrant scandal shows children urgently need protection from the State“, it is not clear from the reports of the migrant children if a judge’s order was needed for DHHS to remove them from parental custody. But even if it was, anyone who knows the CPS system can tell you that judges are giving interim custody orders to CPS agencies ex parte as a matter of course. The interim takeover of custody by CPS is little more than a matter of filing a pro forma custody application before a family court judge. These interim orders are rarely overturned until a full trial or the closure of the case by the CPS, which can take anywhere from 6 months to 2 years. In this way countless children in the US have been deprived of the care and comfort of their parents, some even as infants or toddlers. The CPS system also holds the power to identify and register foster carers and shelter homes without a robust review process. Ofcourse, there are rules for vetting and supervising foster carers and shelter homes, but the system is largely self-regulated by the CPS agencies or their affiliated public authorities. So the system is ripe for trafficking by criminals, malafide elements and immigration rackets. If critics of the CPS system are right then we are looking at a problem affecting hundreds of thousands of children of all races and of very tender age in the USA. DHHS’s latest estimates show over 430,000 children in foster care all data discussed in this article is from the DHHS’s Adoption and Foster Care Analysis and Reporting System AFCARS Report as of October 2017). 44% of taken children are listed as White, 21% Black and 23% Hispanic. This shows that while the proportion of non-white children taken is very high compared with their percentage of the population, white children are also being taken in very high numbers. Over 31,000 of these children (7%) are newborns (below 1 year) and 56% are 8 years old or younger. Over half of foster care children entered care in the year reported, replacing roughly the same number of children who left state care in that year. This replacement is a trend in every year listed in the report and lends some support to the claim by activists that child removals are influenced by federal funding that is linked to the number of children in care. If critics of the CPS system are right then we are looking at a problem affecting hundreds of thousands of children of all races and of very tender age in the USA. The breakdown of reasons for children taken in 2016 is worrisome if it is similar for other years. The majority of children are not taken for physical abuse (12%), sexual abuse (4%) or parental substance abuse (drug abuse: 34%; alcohol abuse: 6%) but for the ground of neglect (61%) or “caretaker inability to cope” (11%) and other non-child abuse reasons such as parental incarceration (8%) and poverty related issues such as housing (10%) (Note: the categories reported are not mutually exclusive). People assume that CPS interventions are only in extreme cases of abuse or neglect. But the AFCAR’s figures show that in fact, sexual abuse, physical abuse and abandonment; at 4%, 12% and 5% respectively are among the minority of circumstances associated with child removal. The law does not restrict child removals to extreme cases of abuse or neglect. Children are removed in what are called “dependency proceedings”; “dependency” because the outcome is to make the child a “dependent” or ward of the court. In the law of many states, dependency is defined not as abuse or neglect but as the parents’ “capability” to provide “care and supervision”, or as a question of the “well-being” or “welfare” of the child. So the threshold for child removals is much lower than abuse or neglect. Some statutes define dependency in terms of whether the child has adequate “subsistence”. So the focus in dependency proceedings is on whether the home conditions or parent’s situation present a risk to the mental, physical, developmental, educational or other aspects of the child’s well-being. This is the way the guiding principle of child protection, the “best interests of the child”, has been articulated in the law. Since a child’s well-being encompasses a range of factors, child protection workers and judges have a wide discretion in determining what it constitutes, and hence in making a dependency finding. This explains why parents will complain that the system was against them from the start and used everything against them. Anything and everything can go into a decision of what is relevant to the “best interests” of a child. This also explains why poor, marginal or otherwise vulnerable families easily fail under this standard of assessment. Families that are poor, unable to communicate well or “make a good impression” with case workers (this affects many immigrant families with poor to nil English skills, or a general demeanour that is alien to case workers) or parents facing a personal or financial crisis, unemployment, a broken relationship, strain from having a disability or a disabled child, a child doing poorly in school – are all liable of being found deficient by these wide and “child focused” dependency laws. This is the human face of the data in the AFCARS report which says 10% of child removals are associated with “housing”, 14% with “caretaker inability to cope” and 2% with “child disability”. Many of the 61% “neglect” cases would also have come about in this way. This is how, for all its good intentions, this version of a “child centric” or “best interests of the child” approach fails children from weak socio-economic backgrounds. Their families are just not considered good enough for them, with the devastating consequence of their removal from them. Even statutes that use the language of “abuse” and “neglect” have defined it widely to include anything affecting a child’s emotional or mental well-being, the use of bad language and so on. So the legal threshold for a finding of dependency is much lower than any common understanding of child abuse or neglect. In the criminal law, physical assault or neglect requires a finding both as to the act as well as the intent of the accused. But intent is not always a factor in defining abuse or neglect, some states call this “aggravated circumstances”, in dependency law. So while a dependency proceeding is pending, a parent may be treated the same way if a child gets hurt because of a stairway guard left open by mistake, as though they deliberately pushed the child down the stairs. Atleast to the extent that the child and all siblings can be immediately taken into interim protective custody where they will be held for several months till the case is resolved. Another distortion in CPS cases is their protocol whereby certain types of injuries, such as internal hemorrhaging behind the eyes and in the brain and fractures in babies and small children are automatically classified as abuse. These are called “shaken baby syndrome” cases. Parents rushing their children to hospital with seizures or pain in their limbs will find themselves accused of abuse if the child’s scans show internal bleeding or fractures. The sick child and all siblings are immediately placed in CPS custody. In the last six years this has happened to a number of young Indian families freshly arrived in the USA to work in the IT sector on H1b visas. These families eventually manage to prove themselves innocent, but not before their children, typically infants and toddlers, have spent 6 months to over a year traumatised and confused in foster care with strangers. families manage to prove themselves innocent but not before their children have spent 6 months to over a year traumatised and confused in foster care with strangers. The low threshold for interim protective custody is justified by child protection advocates using the oft repeated phrase that it is better for ten children to be wrongly removed than for the one child to be left at risk in an abusive family. But this is being very insensitive to the children wrongly removed from loving families. In the wake of the migrant children crisis in the US, experts have emphasised the severe and potentially long term harm to children from such removals. All small children snatched from loving parents react in the same way as the migrant children being reported about – they are terrified, disoriented, weeping, unable to eat or sleep and constantly pleading for their families. The CPS system has to be reformed so that the risk of children being wrongly taken is minimized, and its ill effects mitigated by maximum family contact. In practice, once removed, visitation is limited to a few hours once a week. Also, once the child is with foster carers, stronger provision has to be made for the inspection of suspected abuse in foster care. Under the current laws, the whereabouts of children in non-relative foster care are kept secret and the parents have no access to the foster home. Very little is known of what happens to children once they cross the iron curtain of non-relative foster care. The media have reported sexual abuse, neglect and even death of children in foster care from time to time. There has also been criticism of children being over-medicated with drugs when they are found non-compliant in foster care, or being experimented on with dangerous new drugs that parents are typically vary of. Stories of migrant children being sedated in DHHS custody lend some credence to these stories. At any rate the risks to children of the lack of openness in the foster care system are clear and are another factor requiring urgent reform in the child protection system. We need to know a lot more about how each child is treated once in foster care. It has been a mistake to keep the system closed in the name of the privacy of the child. The dangers to small children in a closed system of foster care far outweigh the invasion of their privacy were the system to be more open. There is a problem. But is child protection in its current form the solution? Going back to the discussion of the problems with child removals by reason of dependency falling short of abuse and neglect, this is not to deny that children may suffer in home situations that are not strictly speaking abusive or neglectful. Let us look at AFCAR’s figures for children removed because of drug abuse by a parent: 34%. This is far short of the majority of cases, and there are reports that many of these involve the use of recreational marijuana, but even so the data indicates a significant problem with drug use by parents, and associated risks for children. There are also other problems. For me as an Indian, the scale of family breakdown in the West is startling: the family instability; the numbers of children born out of wedlock (in some societies and communities the majority of children are now being born out of wedlock); the turnover of relationships of the birth parent with new partners; the absence of fathers; the phenomenon of multiple generations of single mothers where children over the generations end up with no relatives other than their extremely vulnerable mothers; the social isolation in which individualistic societies permit you to live and raise your children; the inter-generational alienation and hostility. All these hardly make for an ideal childhood or greatly nurturing family life. Add poverty, drug addiction or an unsuitable paramour to the picture and things look very bad indeed for any child. There is a problem. But is child protection in its current form the solution? To answer this we need to understand something of how child protection proceedings work. Once the child is found dependent, the case proceeds to two stages – disposition and permanency. Disposition decides what is to be done with the child in the interim; and permanency decides what is to be the permanent living arrangement for the child till majority. Reunification with family is among the legally prescribed permanency goals. In the AFCARS report, family reunification is a goal in double the number of cases in which adoption is a goal. But the bottom line is that after a dependency finding, the primary goal is permanency. Permanency, i.e., a final stable living arrangement for the child, overrides all other considerations, including the call of filial ties. In practice, this means that the worse off you are generally as a family, the less likely you will be to qualify for reunification. It is plain to see that the deck is stacked against the birth family when the system compares a birth family which is poor, vulnerable and already found to have failed the child in the system’s eyes, with an adoptive family, which is better off and with none of the problems that the system has identified in the birth family. A factor that skews decisions in favour of adoptions is that federal funding to state CPS programmes have built-in incentives for adopting children from foster care. The understanding is that children should be moved from foster care to “forever families” as soon as possible. But the effect is to incentivise adoption over reunification if there are adopters waiting, the birth family is doing badly and the child is small and “adoptable”. Juvenile codes can place a lot of pressure on CPS agencies to achieve adoption. In Pennsylvania, for instance, if a child has been in placement for atleast 15 of the previous 22 months, the county agency has to find adopters or document “a compelling reason” for why termination of parental rights “would not serve the needs and welfare of the child.” So the CPS agency is placed in the position of explaining why the child should not be adopted. Defenders of the CPS system will say that each stage of the dependency proceedings requires mediation with the family to enable reunification and that, moreover, reunification is the first option for the child even at the permanency stage. The law also requires consideration of placement with a suitable relative, failing the parents. The AFCARS figures say that reunification is achieved in over half of foster cases. But the other half represents over a hundred thousand children at any given time, and data on the non-reunified children is not divided according to economic status or other factors that make families vulnerable. This is a concern because the way the system is designed, all the power is with the CPS agency. For one thing, it is the same agency that is accusing the parents of being unfit that is being asked to mediate reunification. But there often is no trust or empathy between the parents and case workers, especially if the case workers’ private assessment is that the case should proceed to dependency. For a parent, coming to terms with CPS means you have to accept their assessment of your parenting abilities. But when a case first opens many parents are stunned and disbelieving that they can be accused of abuse at all. So too often consultations between the CPS and the family end up as a stand-off. The parents’ aggressive and emotional responses to the CPS’s suggestions, which are all the more acute if the children are already in CPS custody under interim protective orders, only confirm the CPS officials in their assessment that the family is incapable of being helped. the same agency that is accusing the parents of being unfit that is being asked to mediate reunification….The parents’ emotional responses to the CPS’s suggestions only confirm the CPS officials in their assessment that the family is incapable of being helped. On the other hand, if matters get settled before a dependency finding, it is often because the parents have been cowed into accepting the CPS’s allegations with the promise of eventual return of the child. Parents are told to accept one of the CPS’s lessor allegations of neglect or failure of care in exchange for any allegations of serious abuse or neglect being dropped. An example would be, say, if your baby hit his head by rolling off the bed, and you have been accused of abuse “and/or” neglect. CPS will offer to drop the claim of abuse , i.e., your having hit or deliberately caused the baby to hit its head, if you admit to a lessor count of neglect – which will be formulated as something like “failing to ensure the baby was placed in a position of safety”. So the case can get reported as “neglect” but as it as it is not serious neglect, CPS looks reasonable in deciding to return your child after a few months of “parental training” courses. These could be the facts underlying many of the cases classified as “neglect” in the AFCARS report. Parents are saying that these courses and counselling are also a money making racket. This is why more funding for family services is not the answer to the problems with CPS. The problem is not funds or a lack of family services, but of unfair and biased proceedings against the family which are initiated on a very low threshold for intervention in the name of child protection. So far as placement with a relative is concerned, though the rules require CPS agencies to consider this, again things do not pan out quite that way in practice for vulnerable families. For one thing, if the parents are in difficulties and an able and willing relative is available to help with the children, they are very often already involved in raising the children at the time CPS get involved. So they too get tarnished in the CPS’s negative assessment of the child’s home situation – either as perpetrators or as having been ineffective in preventing the perceived negative conditions for the child. Secondly, if the complaint against the parents ultimately arise from their socio-economic background then the same complaints are likely to apply to their relatives. In fact, relatives who reach out to help often become the targets of CPS investigations themselves. This might explain why the goal of placement with a relative has been prescribed for only 3% of the children currently in foster care as per the AFCARS report. The AFCARS data also shows that non-relatives are preferred even for foster care – 32% of children are reported as being placed in foster care with a relative, compared with 45% with non-relatives. If you add the figures for placement in group homes and institutions, the non-relative foster placements are at 52%, which is 20% more than the number of children in foster care with relatives. If the court makes a dependency finding, then the law says that the CPS has to look into whether return of the child would be in its welfare and best interests. Note the change from dependency proceedings where you had to justify removal from the family. In post-dependency (disposition and permanency) proceedings, the case is on an entirely different footing – now you have to justify return of the child to the family. The enquiry at this stage of the care proceedings is whether parents have reformed themselves or corrected the home conditions complained of. Many parents, especially those from less privileged backgrounds, do not understand this legal technicality. In frustration they will sack their lawyers and start representing themselves. These parents will keep arguing how it was unfair of the CPS to have taken away their children in the first place, but sadly, so far as the law is concerned, none of this is relevant. What is worse is that the parents’ refusal to accept that they are “unfit” or that home conditions justified removal of the children is taken as evidence that they are not capable of benefiting from reunification services and other “assistance” mandated by the state before termination of parental rights can be considered. This is why care orders terminating parental rights will often have fascist-sounding pronouncements about the parents’ refusal to “co-operate” with case workers. These hardly seemed like a fair reason for forced adoption, i.e., adoption of children to strangers even when their birth parents oppose this, until I read the details of the laws for disposition and permanency hearings. The laws require CPS agencies to show that they have provided parents with all “services” and “assistance”. So parents who insist they are fit and don’t need CPS involvement in their lives are reported as failing to “co-operate” and hence failing the reunification test, which then leads to termination of parental rights. Even when parents change tactics and agree to undergo parental improvement therapies, it is no mean feat to convince a court and case workers that you are genuinely “reformed” when the entire thrust of your case previously has been that you are not in need of any reform. This is why you will often hear parents complain that though they did everything that was demanded of them, nothing was good enough for CPS or the family court. Is it right to have a system of child protection that passes such absolute and irrevocable judgment against families? A child “released” for adoption by the court under child protection laws may not even find an adoptive family. The AFCARS figures show that every year since 2012 there are about 60,000 children “waiting to be adopted”. Many taken children spend their entire childhoods being moved about from one foster home to another. They age out of the system, with literally no one in the world who cares about them. Would it not have been better to allow these children access to their families in the hope that bonds would be forged somewhere in their family that would help them later in life? If for nothing else, to give them a sense of belonging? Does it make sense to have a system that separates children so completely for life from aunts, uncles, cousins and siblings? Is it right to have a system of child protection that passes such absolute and irrevocable judgment against families? Can anyone say that none of the hundreds of thousands of children who are permanently removed from their birth families in the USA have any hope of finding something to redeem their kith and kin, if not as children, then as adults? As the threshold for intervening in families has steadily been lowered in the name of the “best interests of the child”, so the system has become increasingly de-sensitised to and accepting of the feelings of children at being removed from their parents. Child removal from parents has for decades been considered a legitimate and acceptable form of child protection in the US and, indeed, in all CPS systems worldwide. As the threshold for intervening in families for child welfare has steadily been lowered in the name of the “best interests of the child”, so the system has become increasingly de-sensitised to and accepting of the feelings of children at being removed from their parents. The concerns being expressed today by the public in reference to the US child migrant crisis of the trauma to children from being separated from their parents are rarely if ever to be heard either in case worker’s assessments or judge’s orders in care proceedings. The hurt to children is considered a minor setback in an otherwise advantageous change for them. Any discussion on CPS inevitably provokes the question: what about the abused children? Child protection advocates will say that there is a culture of assuming the best of families even though the family can be a hidden theatre of abuse and oppression. But child protection advocates need to recognize that they have been largely successful in getting the public to acknowledge and condemn child abuse in the family. Just as the propensity to believe the best of families and shut out investigation in the name of privacy kept child abuse under wraps, so is child abuse by the state being kept under wraps by a closed system of child protection which the public is reluctant to question because it is seen as somehow letting down the children, or siding with their parents against them. But it is now high time to acknowledge that the CPS system has gone very wrong. It is not a fair system and is vulnerable to misuse. Its interventions are too severe and not proportionate to the problems faced by children or families. We owe it to all children to ask for reform.